Todays news item about the death of Jerry Falwell has left me in a somewhat ambivalent frame of mind. On one hand Falwell was an ignorant, fake, bible-thumping, god-bothering, Olympic-class, racist bigot of the first order and frankly, in my view the world is better off without his form of medieval morality. 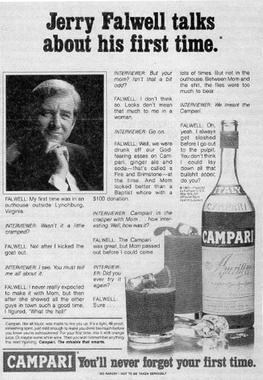 On the other hand, Falwell’s views made him such a ludicrously comic figure that he was a fantastic target for a long history of satire, culminating with the world-famous Hustler Campari Ad parody, for which he (unsuccessfully) tried to sue … for this at least, he will be missed. If there is a God, I genuinely hope (s)he manifests herself to ol’ Jerry as a Black Jewish Lesbian Democrat – just to see the look on his face. Lets hope Pat Robertson follows him soon. Sorry, comments for this article (Falwell Kicks The Bucket) are now closed.